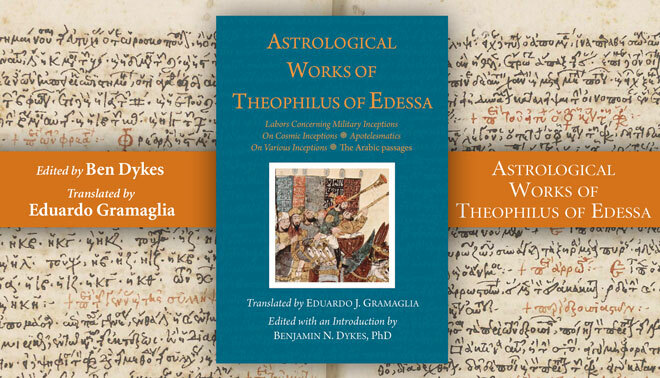 In episode 120 of the podcast Benjamin Dykes and Eduardo Gramaglia join the show to talk about their new translation of the astrological works of the 8th century astrologer Theophilus of Edessa. Theophilus was a Christian astrologer who served the kings of the early Islamic Empire around the time of the pivotal transition between the Umayyad and Abbasid Caliphate. He was an older contemporary of other notable astrologers who lived during the early Medieval tradition like Masha’allah, although he is unique in that his surviving works were written in Greek rather than Arabic. He also drew on a number of earlier Greek sources such as Dorotheus of Sidon. As a result of this, Theophilus is an important transitional figure between the Hellenistic and Medieval astrological traditions. The new translation by Ben and Eduardo marks the first time that Theophilus’ astrological works have been fully translated into any modern language, and in this interview we talk about who Theophilus was, the process of doing the translation, and the significance of his work. The book is titled Astrological Works of Theophilus of Edessa. Published in May of 2017. Since it is his first time on the show, we introduce Eduardo and talk about his background. This is Ben and Eduardo’s second collaboration together, after their 2013 translation of book 3 of Hephaistio of Thebes. Who was Theophilus of Edessa? A Christian astrologer from ancient city of Edessa, which is located in what is now south-eastern Turkey in modern times, near the border with Syria. What is significant about his work? Is one of the earliest notable Christian astrologers. Wrote some of the earliest works on military and horary astrology. What are the texts translated in this volume? What was the process of preparing this translation like? Some of the material was edited in the CCAG. Another important aspect of Theophilus is the prevalence of horary astrology. Often just focuses on using the four angular houses, rather than profections between specific house rulers. Previous discussion about earlier traces of horary in Dorotheus and Hephaistio. He was a Chalcedonian Christian. At the beginning of one of the texts he spends a lot of time talking about and defending astrology within the context of Christianity. Theophilus talks about Genesis and the seven day week, and the associations with each of the planets. Theophilus then is one of the first major/notable Christian astrologers we know of in history. He was involved in doing some pretty serious military astrology. He was present at some pretty notable battles. Theophilus is the main later astrologer who continues the tradition of treating Saturn as feminine that we see in the Arabic version of Dorotheus. Theophilus was probably influenced by Dorotheus in this, as Dorotheus is really his main source for much of his work. The question is whether he had access to something like the original Greek text, and thus this confirms that Saturn was actually listed as feminine there by Dorotheus originally, or whether T was drawing on the Persian translation, where this could have been an error in the text. Not clear if this question can be resolved. Saturn is a masculine planet that represents masculine principles. The reason it represented ‘female birth’ is because female children were a difficult burden at that point in history. They’re not saying that Saturn is feminine, they’re saying a female child is a Saturnine event. Gentlemen three, my hat is off. What an enthralling discussion. And how lovely to “meet” Eduardo Gramaglia! Can’t wait to receive this book, scheduled for delivery tomorrow. Ben, I laughed out loud at your reference to the cinematic tome, “How I Did It” – yes indeed, we need to find its astrological equivalent! My thanks to all three of you. Thanks for the fascinating peek into the effort of translating ancient astrological texts–as well as Theophilus. The book is already in my hands. I have to stop listening to your podcasts, Chris; it’s costly! I have the book but after a cursory read through can’t determine the house system Theophilus use’s? It sounds like whole sign as he mentions houses in the context of hour markers? Any one enlighten me please?